Minerd.com regularly is in the news and its content generates news. Telling the story of our website, our extended population of cousins, national family reunion and proprietary brand of research is a key to reaching many thousands of cousins and the public at large and sharing this website's encyclopedic trove of family information. Our goal is to educate anyone about our mission to document the early lives of more than 1,900 of our collective forefathers and mothers, and the enormous, long-term collective impact that an average, ordinary American family can have on society. Here is a summary of news-making efforts since 1999. February 2019 - The newly issued edition of the Research Review Magazine of the Little Big Horn Associates -- a national organization devoted to studying the life of General George Armstrong Custer and the famed battle -- contains the article "Speckled Legacy: Tom Custer in American Pop Culture." Authored by the founder of this website, and using proprietary content originally published on Minerd.com, the piece surveys the photographs, news and magazine articles, books, stage plays, and television and movie films which have influenced Americans' limited perceptions of the general's brother Thomas Ward Custer, who twice won the Medal of Honor but who died at the battle with the general and three other Custer family members, an overlooked American tragedy. Veteran reunion-goers will remember this theme from our 2002 national reunion and that Tom produced a son out of wedlock with Rebecca Minerd of Tontogany, Ohio. Feb. 4, 2019 - The Minerd.com Annual Review 2018: A Report for Family and Friends is released to the public. 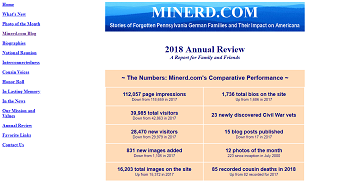 Now in its 19th year online, the main objective for Minerd.com the past year was bringing to life more of the lost stories of forgotten Pennsylvania German families and their impact on Americana. The numbers bear out the incessant activity of adding new material, up in some areas, down in others but always in motion generating content. They include 112,057 page impressions for the year, down from 118,659 in 2017 -- 39,985 total visitors, down from 42,863 -- 28,470 new visitors, down from 29,979 -- 831 new images added, down from 1,105 -- 16,203 total images on the site, up from 15,372 -- 50 new biographies added, down from 76 added the previous year -- and 1,736 total bios on the site, up from 1,686. Above: Younkin reunion group tours the stained glass windows at Turkeyfoot Valley Baptist Church in Confluence. Below: the group in historic Ursina Cemetery. July 28, 2018 - Minerd.com's founder again leads a tour of local historic sites and presents stories about lives of the past at the annual Junghen-Younkin Reunion in Somerset County, PA. The first stop is the Turkeyfoot Valley Baptist Church in Confluence, which features beautiful stained glass windows memorializing cousins and extended family Amanda (King) Younkin, Lucinda (Sweitzer) Younkin and Mary A. Brooks (Harned) Forquer, . The group also pays respects at the grave of Silas and Zobeida Jane (Ream) Younkin in the church's adjoining cemetery. The second stop on the tour is the historic Ursina Cemetery, where fascinating, long-lost stories are told about the lives of those cousins resting there for eternity. Among them are Ross and Emma (Rush) Younkin, Charles and Sabina (Hinzy) Burgess, Levi and Susanna Elizabeth (Rose) Durst, Christian and Amanda (Phillippi) Koontz, Benjamin Franklin and Harriet (Younkin) Romesburg, George and Elizabeth "Betsy" (Younkin) Hare and Dr. Winfield Scott and Martha Jane (Walter) Kuhlman. Other cousins mentioned in the tour are offspring of the families of "Devil Jake" and Sarah (Tannehill) Younkin, Samuel Wirsing and Edwinna Canallas (Younkin) Glotfelty, Rev. Levi and Catherine "Katie" (Younkin) Lichliter, "Weasel Jake" and Catherine (Faidley) Younkin and James and Elizabeth (Younkin) Andrews Jr. In the afternoon, Minerd.com's founder also conducts the annual auction to raise funds for the Junghen family scholarship. 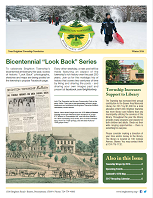 June 2018 - The latest edition of the Junghen Family News Bulletin of the Younkin Reunion, edited and published by Linda Marker, highlights last year's reunion tours and presentation involving the founder of this website. 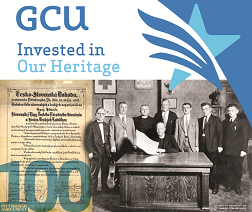 April 2018 - The GCU -- formerly the Greek Catholic Union headquartered in Beaver, PA -- uses a rare archival image from Minerd.com's "Burgh Nation" webpage to illustrate one of its advertisements. The GCU's ad celebrates the 100th anniversary of the 1918 "Pittsburgh Agreement" in which the nation of Czechoslovakia was formed in the Steel City. The vintage image dates to 1926 and shows the leaders of the Pittsburgh district Czecho-Slovaks, standing behind Msgr. Andrew Hlinka, who in turn holds a copy of the pact. In the ad, GCU states that "We are proud of our Carpatho-Rusyn heritage and our Founders' who began our organization in 1892 with little more than a dream. Today we are the second largest fraternal insurance company domiciled in Pennsylvania with assets over one billion dollars." 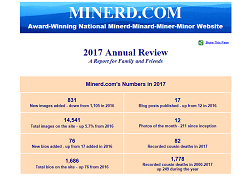 March 17, 2018 - Minerd.com releases its Annual Review 2017, summarizing the research, writing and archiving that goes into the award-winning family website. Among the 2017 numbers are 831 new images added, down from 1,105 in 2016 -- 15,372 total images on the site, up 5.7% -- 76 new bios added, up from 17 the previous year -- and 1,686 total bios on the site, up 76 from 2016. 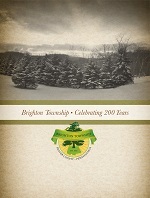 December 2017 - More than a yearlong campaign of "Bicentennial Look Back" historical images concludes on the Facebook page of Brighton Township, Beaver, PA, and several are published in the related commemorative hardcopy book, Brighton Township • Celebrating 200 Years. The township utilizes a number of Minerd.com Archives images for the series, and those making the final cut into the book depict Captain Sam Brady, the Lincoln Highway, movie star Roy Rogers and Trigger, landscapes of local farms from the 1876 Atlas of Beaver County, a Beaver County Times news clipping of the Tusca Ridge Garden Club circa 1972, and rare portraits of Col. Henry Bouquet and Gen. Lachlan McIntosh who utilized the Tuscarawas Trail as military passage in the 1760s and '70s. Minerd.com is honored to have served the public as a resource with this series. 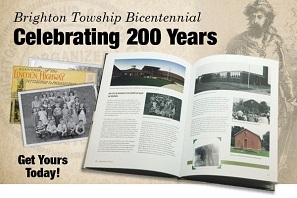 Minerd.com Archives images used in print and social media to celebrate the bicentennial of Brighton Township near Beaver, PA. Below: some of the Archives images appearing in the book, L-R: Gen. McIntosh, Col. Bouquet, Lincoln Highway. 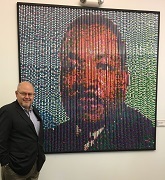 July 22, 2017 - Minerd.com founder Mark Miner is the featured afternoon speaker at the annual Junghen-Younkin Reunion in Kingwood, Somerset County. His presentation focuses on the "Younkin Women of the Windows" -- cousins and/or their spouses who have a memorial window in their honor in the Turkeyfoot Valley Baptist Church of Confluence, PA. They include Lucinda (Sweitzer) Younkin, widow of Civil War veteran John H. Younkin; Amanda (King) Younkin, daughter of Thomas and Barbara (Younkin) King and first wife of Civil War veteran Balaam Younkin; and Mary Ann Forquer, who was not a cousin, but after her death, her widower LeRoy Forquer married our Sabina Dull Rush of the family of Frederick Dull. 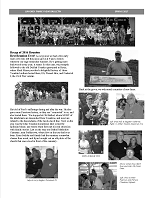 May 27, 2017 - The Spring 2017 edition of the Junghen Family News Bulletin, edited by Linda Marker of Rockwood, PA, arrives in mailboxes nationwide to promote the upcoming Junghen-Younkin Reunion to be held July 21-23, 2017 in Somerset and Kingwood, Somerset County, PA. The newsletter includes content republished from Minerd.com -- "Old Land Transactions" and an image of the "Younkin Profiles" table of contents page. Linda is of the family of Frederick J. and Delilah (Faidley) Younkin of Kingwood. The newsletter also advertises that Minerd.com's founder, a member at large of the Junghen-Younkin reunion planning committee, will speak at the reunion on Saturday afternoon. The Junghen news bulletin is a lineal descendant of the Younkin Family News Bulletin published by the late Donna (Younkin) Logan of Hancock, MD from 1990 to 1995 and an earlier version of the News Bulletin produced from 1937 to 1941 by Charles Arthur Younkin of Charleroi, PA, secretary of the Younkin National Home-coming Reunions. May 27, 2017 - Mark Miner releases three in a series of Minerd.com Podcasts which he recorded using his speaking script from the May 21, 2017 presentation at the Jersey Baptist Church of Ursina, Somerset County, PA. The first podcast features stories about Civil War veterans Jerome B. Jennings, Jacob J. Rush and LeRoy Forquer. The second podcast is about veterans Harrison K. Younkin, John Enos and Marcellus Andrews. The third and final podcast in the series focuses on the stories of Foster Younkin, Balaam Younkin and Charles Rose. Above: Miner speaking at the historic Jersey Baptist Church, Ursina, PA, presenting stories of nine Civil War veterans who were original members of the local Ross Rush Post of the Grand Army of the Republic. Below: some of the same veterans posing in the ancient church burying ground. View a video clip. May 21, 2017 - At the invitation of the Sons of Union Veterans of the Civil War, Mt. Union Church Camp #502 in Somerset County, PA, Minerd.com's founder is a guest speaker at the 2017 Memorial Program held at the historic 1775 Jersey Baptist Church in Ursina, PA, presenting the stories of a number of Civil War veterans buried in the church's ancient cemetery. Among them are Balaam Younkin and Foster C. Younkin (of the family of Jacob J. and Dorcas [Hartzell] Younkin), LeRoy Forquer and Jacob J. Rush (of the family of Frederick and Margaret "Peggy" [Faidley] Dull), John H. Younkin and Charles Rose. Members of the post placed wreaths at the graves of the soldiers in the old section of the burying grounds. Other members of the GAR's Rush Post buried at other cemeteries include Marcellus "Marsh" Andrews, John Enos, Jerome B. Jennings and Harrison K. Younkin. View a video clip of the presentation. The backstory: The SUV and Auxiliary had the unique opportunity to acquire and rescue the old GAR records before they were sold into oblivion on eBay. They were being advertised by an antique dealer in Albany, NY who completed the same with the group. The records date from 1883 to 1921, when the last member died. Cousin Barbara Bowers, of the family of Bertha (Ream) Conn, generously donated a box of the soldiers' original applications to the GAR. 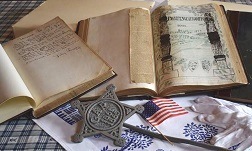 The books were repaired and digitized, and along with the applications will be placed on long-term loan with the Somerset Historical Center to ensure that they never leave home again. This tremendous community initiative was organized by Robert Wrigley and cousin Linda Marker of the family of Frederick J. Younkin. Feb. 9, 2017 - Minerd.com releases its 2016 Annual Review detailing continued activity the past year to attract visits and publish the stories of thousands of forgotten lives involving a frenetic pace of research, travel and writing. Not a week went by that meaningful content of some type was not added to the site. Among the indicators are the number of biographies added or expanded during the year – the number of archival images posted – the number of cousin deaths recorded – and the number and variety of blog posts. Last year, 17 new biographies were added – many so lengthy that they will be subdivided into new ones in 2017 – and many hundreds more bios expanded with new findings – bringing the total on the site to 1,610. Some 1, 034 images were added as illustrations, bringing the overall site-wide count to 14,541. Since we began counting in earnest on July 1, 2000, the known number of deaths of cousins and spouses is 1,629, or one every 3.7 days. While many of these are related to old age or illness, some are in fact due to domestic violence and drug and alcohol addiction. In some periods of our heaviest losses, such as in the 2002-2003 timeframe, we lost a cousin/spouse once every 2.94 days. 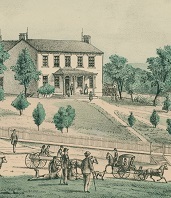 January 2017 - Scanned images of old farmsteads scenes and detailed maps from the 1876 Atlas of Beaver County, Pennsylvania, courtesy of the Minerd.com Archives, are published in the Winter edition of Your Brighton Township Newsletter in Beaver County, PA in celebration of the township's bicentennial anniversary. 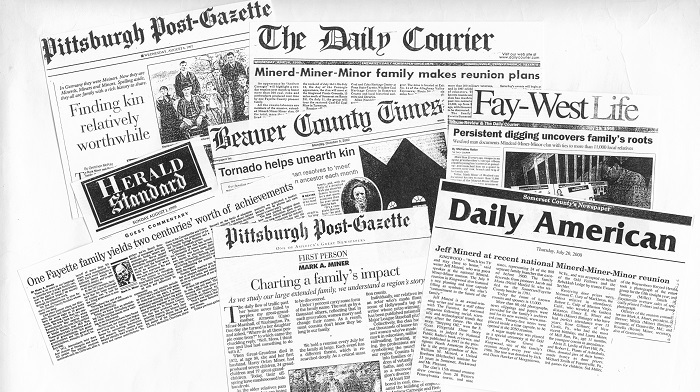 Additional Minerd.com Archives images are being deployed as part of an ongoing "Bicentennial Look Back" series on the township's popular Facebook page. Brighton Township is one of the Western Pennsylvania region’s most affluent, beautiful and serene communities that is within minutes of the Borough of Beaver, a Pittsburgh Magazine “top 10 stable great neighborhood” and the Beaver Area School District, a Pittsburgh Business Times “top 10 percent regional district.” The township features immediate access to local recreation and medical center, Pittsburgh attractions, interstate highways, an international airport and excellent shopping. With significantly lower property taxes, the township has grown steadily during the past five years as a safe, vibrant bedroom community in which to raise a family. 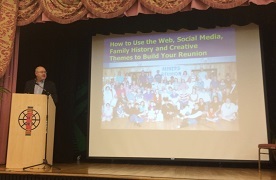 Oct. 1, 2016 - At the invitation of Experience Columbus -- also known as the Greater Columbus Convention & Visitors Bureau in Ohio -- Minerd.com's founder Mark Miner serves as keynote speaker at the annual family reunion planning seminar, hosted byMiner's topic is "Reinvigorating Your Reunion" using a variety of web, social media, research and news publicity tools. The Saturday morning seminar, held at the The Martin Luther King Jr. Arts Complex, draws 100 reunion planners. 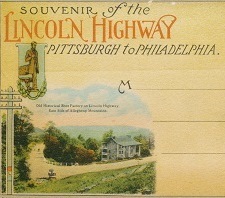 Sept. 9, 2016 - A rare historical image from the Minerd.com Archives, a vintage postcard showing the nation's first oil derrick at Titusville, PA, is used in a "This Is Your Life" powerpoint presentation at the 90th birthday celebration for legendary community leader Robert Allen Smith held at Beaver Station Cultural and Events Center in Beaver, PA. Smith, a retiree of both U.S. Steel and Michael Baker Corporation, was born in Titusville but spent most of his life in Beaver County, PA. In addition to impressive business achievement, the nonagenarian Smith is celebrated for his nine decades of renaissance accomplishment as a model builder, railroad enthusiast, self-taught keyboard player, raconteur, urban design advisor, reader, editor and publisher, pen and ink artist, watercolorist and champion of public education, foundation philanthropy and most especially local history through his beloved Beaver Area Heritage Foundation. Public landmarks in Beaver bearing Smith's touch include Beaver Station, the Beaver Area Heritage Museum and log house, Fort McIntosh monument, 1877 courthouse clock tower reconstruction and $3 million Streetscape improvements.This website's founder worked for Smith from 1985 to 1991 and served as master of ceremonies for the birthday celebration. July 22-24, 2016 - Minerd.com founder Mark Miner leads a Saturday morning tour at the 2016 Junghen/Younkin Family Reunion at Kingwood, Somerset County, PA. The tour includes stops at the Delilah Younkin Cemetery in Hexebarger -- where Civil War veteran Frederick J. Younkin and his brothers "Weasel Jake" Younkin and Eli S. Younkin and their cousin Catherine (Younkin) Firestone rest for eternity, among the ashes of other ancient Younkins, and where the first unofficial Younkin National Home-coming Reunion was held by coincidence in the summer of 1934. Other tour stops include the old farm house of Jacob and Minnie (Miner) Gary in the Hexebarger valley and the Bethel Methodist Church Cemetery at Paddytown to pay respects to the grave of ill-fated Civil War soldier Albert Andrews of the family of Elizabeth (Younkin) Andrews. Following the Saturday noon picnic lunch at the Kingwood Odd Fellows Grove, Miner presents stories about the Jacob and Salome (Weimer) Younkin Jr. family, drawn from his Younkin research and biographies published on Minerd.com. View the full table of contents of Younkin content on this website. 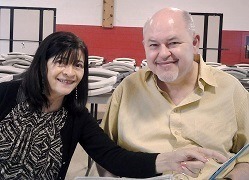 May 30, 2016 - At the invitation of cousin Rhonda (Cook) Tabler -- one of the panelists from last year's national Minerd-Minard-Miner-Minor Reunion -- Minerd.com's Mark Miner is a guest speaker at a Memorial Day family gathering in Cutler, Ohio. The event is billed as a "Celebration of Life" tribute to the late family genealogist Irita (Goins) Canady, who also was a panelist at the 2015 Minerd gathering before her untimly death late last year. Among the cousins Miner meets for the first time are from the family branches of Civil War veteran Henry C. Minerd, sister Ruth Ann (Minerd) Kennedy and brother Jacob Minerd Jr. He also has the privilege of meeting Ada Woodson Adams, President of the Multicultural Genealogical Center in Chesterhill, Ohio. Above left: cousin Rhonda Tabler reads a tribute to late cousin Irita Canady. 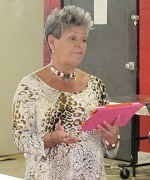 Right: cousins Joanne (Johnson) Smith talks about her branch. Below: conversation about "who's who" at the Mayle-Holbert Reunion, Elizabeth, WV. May 28, 2016 - As an invited guest, Minerd.com's Mark Miner attends the Mayle/Holbert Reunion, Elizabeth, Wirt County, WV. This is an annual gathering of the descendants and related families of Riley Mayle and Laura Holbert), and always is held the Saturday before Memorial Day. 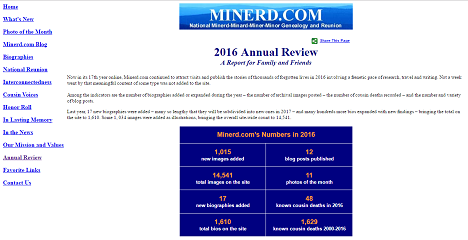 January 2016 - The Minerd.com Annual Review 2015 is released documenting the site's continuing growth the past year. 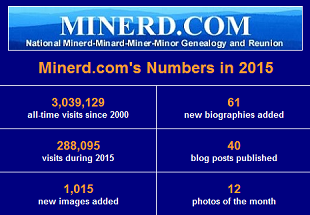 In May, Minerd.com celebrated its 15th anniversary – launched a new blog – in March and May enjoyed all-time record numbers of visits – and in November reached its 3 millionth visit of all time. The number of visits in 2015 were the highest since 2007 and totaled 288,095. Over the span of 15½ years since the site was first launched, total visits stood at 3,039,129, up 9.8 percent from 2,751,034 last year at this time. During the year, 1,015 new photo images were added to the site, in comparison with 948 last year. At year-end, the site had a grand total of 13,507 archival images, up from 12,492 last year, a growth rate of 8.1 percent. Some 61 new biographies were added in 2015, up 45 percent from 42 last year, for a grand total of 1,593 bios. These bios tell tens upon tens of thousands of family stories unique to the clan. View>>>.